We decided to trust him on that and of course he was right. Erinn couldn’t have been nicer when she (finally) met us. I checked in to my accommodation, Heliotropio Studios, (one of the best places I ever stayed, by the way, I wholeheartedly recommend them for comfort, location and service), and waited for Kaitlin (aka Katy Perry) to arrive by ferry later that night so I could pick her up in our rental car. Our first full day there, Basil arranged for the number one thing to do in Milos: Whole day boat trip with Oneiro. Unfortunately, Erinn gets really sick on boats so she couldn’t join us, but so many of the guests came we were so many we needed two boats to accommodate us all. The boat trip included food, drinks, lots of snorkelling, guided trips here and there where we put out anchor and it was generally one of the best days of my trip (minus the sunburn I was inevitably gonna get.. which turned out to be pretty severe). At one point Captain Elias showed us some chorals that were so colorful I thought they were fake. Like, painted for the tourists kind of fake… But they were real. Insane spectacle… So beautiful. The day before the wedding we all gathered at Firiplaka Beach (one of the most famous beaches on Milos) for some frolicking in the water and sunbathing (both of those where off the table for me because of my intense sunburn, but I enjoyed myself in the shade anyway). 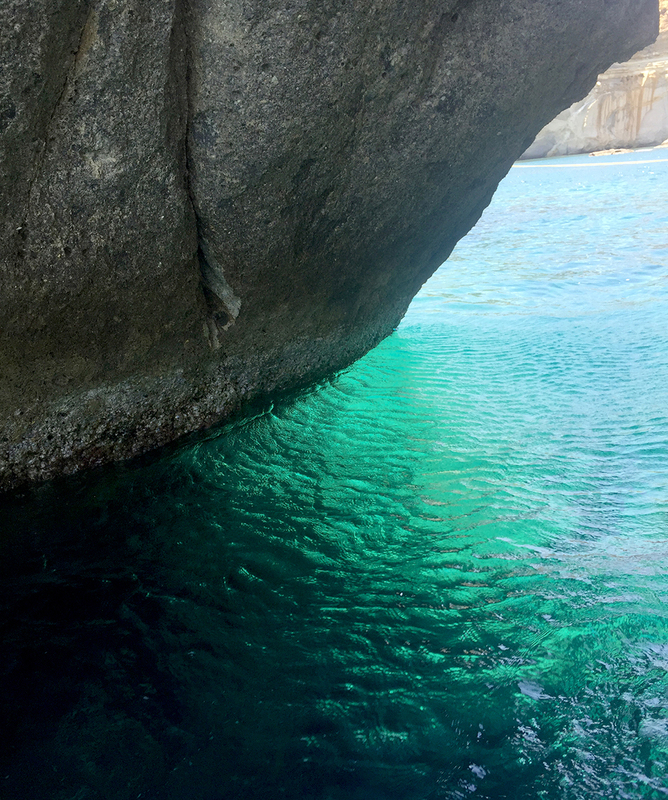 Firiplaka was really beautiful, exactly how I imagined a Greek “paradise” would be. 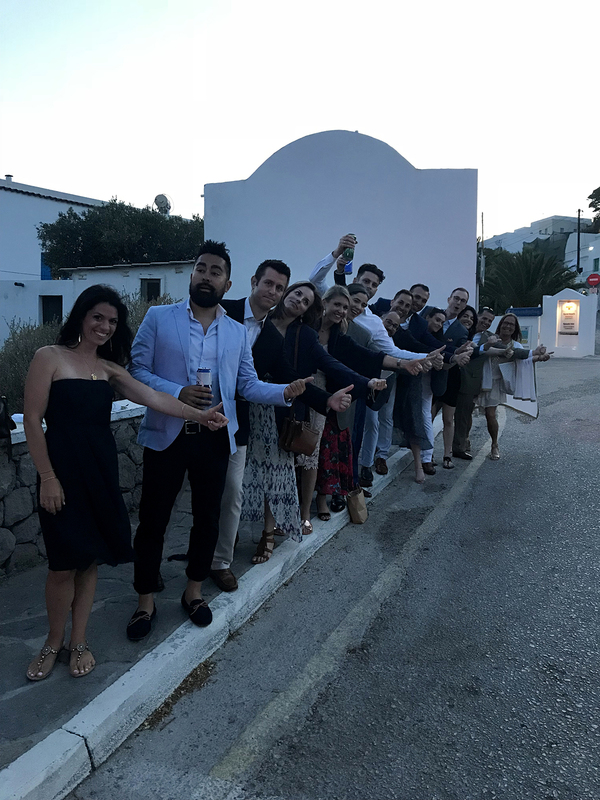 After a day at the beach the wedding party had booked a local restaurant for the rehearsal dinner, where Erinn looked an absolute dream and we stuffed ourselves on fabulous Greek food. The bride and groom held their respective speeches this night, instead of during the actual wedding day, which made a nice change, I thought. The wedding stretched out for more days and each event became more special for it. Kaitlin and I decided to have some “ex-roommate excursions” while on Milos, so before the wedding we drove around in our little rental car and explored the Catacombs of Milos and Plaka. To visit the catacombs you need a guide and there is a limit to how many can go down at one time. Luckily for us there was no massive queue, only us two and four Australians. While waiting outside for the other group to finish we got to talking to them, mostly because they discovered my New Zealand tattoo and wondered “why I had tattooed the wrong island on my leg”. The catacombs where interesting if you’re into history and old stuff, but the tour is over rather quickly as they’re not big at all, there’s not that much to see, so unless you’re especially interested you’re just as happy giving them a miss. (I’m very glad I got to see them, I’m just aware stuff like this isn’t interesting for everyone). The nearby little amphitheatre is worth a look and this is also the area where the “Venus de Milo” was discovered (the original statue now resides in the Louvre, Paris, for some reason). Oh, and you CAN drive all the way down to the catacombs, it just looks inaccessible. A random older dude tried to talk to us in Greek, saying what sounded like “catacombs?” and mimicking a car pointing in the general direction of the catacombs. He got us heading the right way, but don’t think he understood why we were walking “all the way” down there when we could’ve taken the car. (It was about 15 minute walk, definitely walkable). The wedding was a traditional Greek wedding held at the Panagia Korfiatissa Church in Plaka. There were four priests(!) and the ceremony was held in Greek, English and probably something else I didn’t catch. It was fascinating. I’ve been to many weddings, but this was quite different to any of the others. The ceremony wasn’t as long as I kind of feared it might end up being (I had heard of Russian orthodox weddings that took hours on end, but this was long enough to be meaningful, yet short enough to be pleasant. We waited for Erinn a short walk from the church, (Basil waited at the church of course), and when she arrived we all followed her while musicians played Greek music. I bet Basil was nervous or giddy hearing his future wife approach as the music got louder. Afterwards we all enjoyed the sunset view from right outside the church doors, sipping a cool drink and taking photos before we headed to the buses that were taking the guests to the venue where the dinner was held. None of us really knew where this was so Kaitlin, Ryan and I made sure to stay close to the wedding planner at all times, because we figured she would get us there. She worked quite hard at getting the entire group down to the buses, which made it all the more… eh… amusing(?) when we found out she’d left about 20 people behind in Plaka with no plan on how to get them to the venue and without either of them knowing where they needed to go. Luckily, they got a hold of the florist who knew the address and they jumped into taxis, so they made it, but by the skin of their teeth. At the venue they had photo props! Greek inspired, of course, and we (the Egypt group) were all over them at once. Or at least after the first glass of wine… This went on until Ryan totally destroyed Zeus’ shield. Totally his fault. It wasn’t the wind against the cardboard, it was Ryan “being dramatic”. Totally. The rest, as they say, is history. The maid of honour and best man gave their speeches, we ate way too much food before they brought out more food. Basil and Erinn had their first dance as husband and wife to “Stand By Me”, Basil had to elegantly kick Erinn’s dress (the train) around while they turned and there was much dancing. Greek and otherwise. Erinn and Basil performed a sort of dance each that they had practiced involving shotglasses with some kind of booze in it (Ouzo?). Basil did quite well in picking it up from the floor with his mouth and drinking it. Erinn had to place hers on her forehead and dance around a bit(!) before drinking it. This resulted in her pouring it all over her face the first time and nailing it on the second try. They looked amazing. The focus on booze though, this wedding could’ve been Norwegian.